When the names Wolfgang Kramer and Michael Kiesling appear on a box cover, I immediately perk up. As a design team they have given us such games as Tikal, Pueblo, and, the lesser-known, Trapper. Alone or with other collaborators they have created El Grande, Vikings, and Heimlich & Co., all of which remain on my shelves and continue to provide worthwhile gaming experiences for my family, students and gaming groups. Not all of their work is a ‘must buy,’ however, and some such as Sunken City probably should not have seen the light of day. 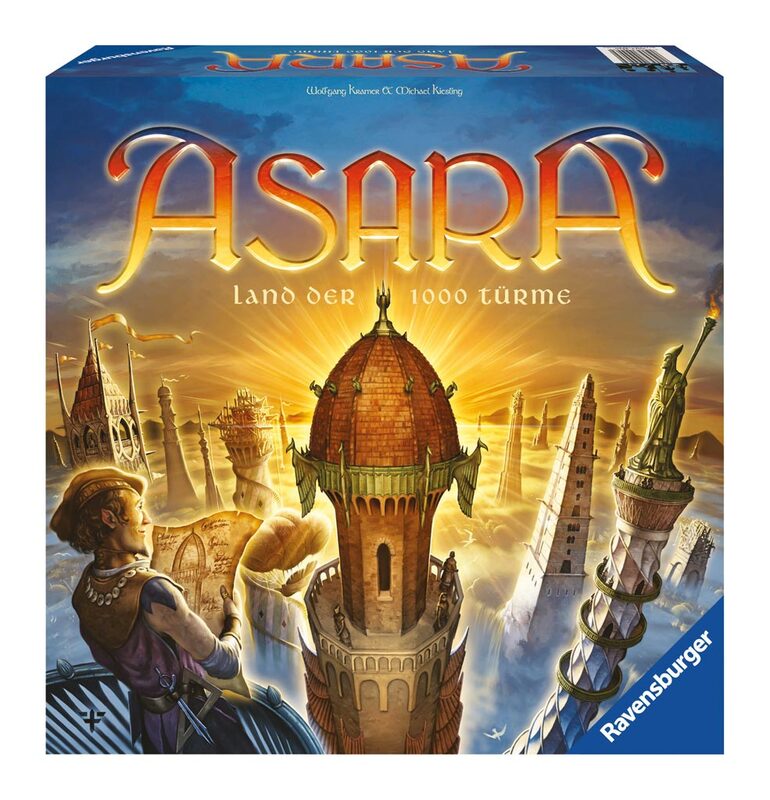 Having said that, I am happy to report that their latest Ravensburger release, Asara, is worth checking out. In Asara players are “building magnates” vying to gain the most prestige by building towers “in a magical realm.” And the ‘magical realm’ itself is nicely designed. Like previous Ravensburger titles such as Diamonds Club, instead of a foldout board, this one fits together like a jigsaw puzzle that is shaped like a plus sign, but with additional triangular board pieces slotted into the four corners. Players send their workers to various places on the game board, selecting and paying for available tower pieces, obtaining more money, paying extra to dig through piles for specific needs, or building towers. The game takes place over four years (rounds) with interim scoring after each and a final tallying at the end where much of the prestige is awarded. Does this sound familiar to many Eurogames you may have played before? Well, thankfully there’s a single mechanism that makes the game click. Players start the game with varying amounts of money based on player order, and a player screen behind which they hide their money, as well as the tower pieces they purchase. The small variance in money offsets the greater number of choices the starting player has, but there are a myriad of possibilities even for the fourth player in a round. Players also receive 7-9 worker cards depending on the number of players. And those cards are the key. Workers come in 5 different colors and you will be playing them to the board to obtain the items desired. If you are the first person to place a worker card in a particular area, then you can choose whichever color worker you want. However, any subsequent worker placed into that area must match that previous worker’s color. If a player cannot do that, then two cards can be played as a wild to obtain items from that area. This mechanism is the key to the game. Planning out what you need, how you are going to use the cards/colors you have, forces you to stop and ponder the possibilities. So what are those workers doing? Well, four of the places on the board contain tower segments. These are flat cardboard, so you aren’t building nice 3-D towers, but the art by Franz Vohwinkel stands out and works well (with one exception that I will discuss later). Bases and turrets/tops are mandatory – in fact you cannot begin a tower unless you can immediately put a top on it – and midsections and windows can fit in between. Oddly, towers can be added to in later rounds – it seems that turrets can just be lifted off and replaced in this “magic realm.” In each of these four sections there are between six and eight pieces face up and available, and empty spots are not refilled until the next round. The tower pieces come in five colors (thankfully different than the worker colors) and each color has a set price per piece, with the white towers costing the most at $8 and the brown towers costing the least at $3. This cost disparity is then reflected in final scoring (more on that later). The two triangular sections used in the base game include the Bank where there are single slots to obtain 12/10/8 coins, or a slot for multiple cards for 5 coins. Getting in early here has the double advantage of obtaining the most coin and setting the color of worker for the round. The other section allows a player to pay to look through the face down tower tiles in a particular section, and then pay for the tower section itself. This action may seem costly, but does allow someone to snag the exact piece he or she is looking for. There is also a slot in that section for becoming start player for the next round. This is the only way that the start player moves AND the person with the start player token earns a point at the end of the year. Finally, the center of the board contains the “Building Circle.” When you place your worker here, this allows you to take your tower pieces out from behind your screen and build them in front of you.. Worker color matters here as well, and each space denotes not only the cost for building, but also how many floors you can build. For example, if you wanted to build 5 floors, then you would place the worker of the proper color on the 5 space, pay $5, and build your 5 tower segments. Each new tower built MUST have a turret and base, and you can add in any window or mid-section during your initial build or later. Since there is only one slot (1-7) for building, if someone takes the 5 slot before you, you may wind up paying 6 to build just 5 pieces, or putting one fewer piece out and choosing the 4 slot for the round. You play the round until everyone has used all of their workers – or cannot use a worker because there are no slots where a worker can be used – and then you have the year-end scoring. Each round then starts over with more worker cards and more seed money. Tower pieces that are unbuilt remain behind player screens and can be built later. OK, let me explain that last one. SOME of the tower pieces have gold decorations on them. If any of the towers you have built contain bling, you get a point per piece of bling. This really adds up over the course of the game, so players need to try to get some gold decorations. Hence, being the start player gives you the chance to grab the best bling available. This area works similarly to the Bank, but gives you more workers for your hand. You pay 0/2/4 and cough up one worker to gain two. This doesn’t seem like a huge payoff, but can give you more of a variety of colors of workers, and more actions in the round. It also works as an alternative “good first move” given that the Bank is so attractive initially. I would always play with this. Unlike the area discussed above, I am less certain of the essential nature of this board. Players can pay to search through a stack of tiles that are the same size as the window tower pieces – 4 coin to look at 3 and keep 1, 10 coin to look at 5 and take 2. These tiles can then be placed on TOP of windows that are already built and count the same as a tower piece with bling on it. Given the random nature of the blind draw AND the fact that this is the one place where the art makes it difficult to discern which color tower you are selecting, I am less enamored with this addition. However, with 4 players this adds another possible choice as the board gets crowded, so I would use it in that situation. Asara is not a “wow” game for me, and certainly not the best of the Essen 2010 crop (that award goes to Vinhos, as many of you may know if you listen to my podcast), but as a game on the lighter end of the Eurogame spectrum, I have enjoyed my plays so far. It works well with both 2 – 4 players, though the 2-player game is not as exciting since the choices are not as painful because you have more control over worker colors in particular areas. Besides the artwork situation mentioned above on the lighted Windows tiles, my only other qualm would be the cardboard thickness. Unlike some of the other publishers who continue to construct games with nice, thick cardboard pieces, Asara’s pieces feel a bit flimsy…but that doesn’t take away much from the solid gameplay the game provides. I have been a huge fan of Wolfgang Kramer’s designs for years and years. I particularly enjoy his meatier fare, including games such as Tikal, Torres, Java and Princes of Florence. While not at the same level in terms of depth and decision making, Asara is still a challenging game that forces players to make interesting decisions throughout the proceedings. There is a persistent tension driven by the desire to perform numerous actions, but not having enough buyer cards to perform them all. Plus, opponents can scoop the more desirable and low-cost areas, forcing you to pay more and/or play more cards to perform the same action. There is a constant “Do I play here or there?” choice that confronts players each and every turn. Wait too long and you may well find yourself cut-out of an area, or having the most preferable options in that area taken. These decisions, however, are not overwhelming, and the game is fairly easy to learn and understand. So, while there is enough here to challenge dedicated gamers, it is also very accessible to folks who are not familiar with hobby games. That’s a big advantage. A typical game plays to completion in 1 – 1 ½ hours, so even the length is suitable for variety of different groups. 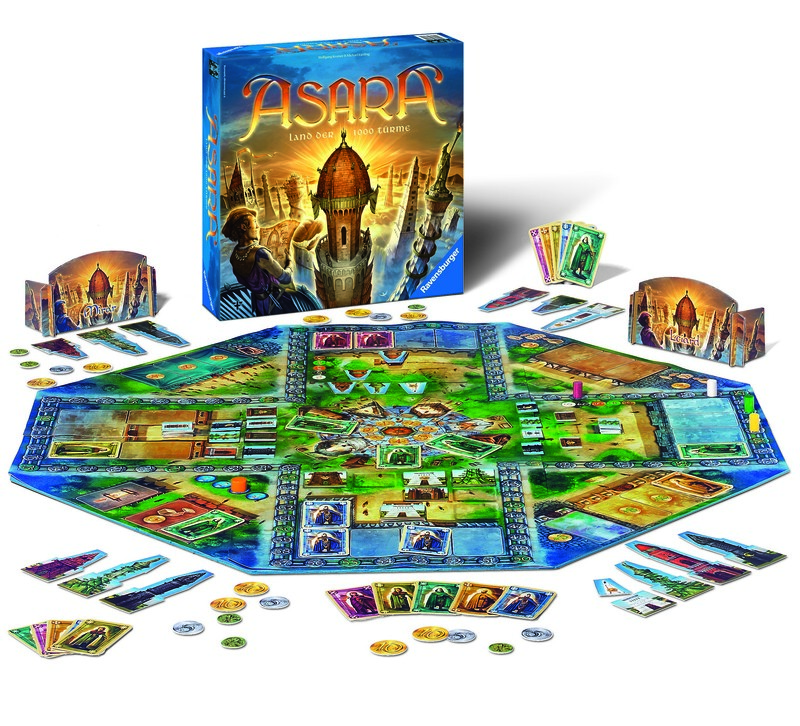 Kramer and Kiesling haven’t introduced anything revolutionary in Asara, but rather have taken some familiar mechanisms and blended them together to form a game that is tense and enjoyable. Considering their previous body of work, I shouldn’t be surprised! An excellent and simple game, with an amazing fluent mechanic and an outstanding graphic. For me one of the best Kramer of ever. I think it is an extraordinary family game and my preferred choice for the SDJ: of course materials and arts are at top level. It is also good for expert gamers since it offers enough decision (especially using all the optional rules) in a game that could be played easily in less than 1 hour. Really a nice surprise, since I’m not used to like too many Ravensburger titles. Color me pleased. I also like Kramer’s designs and get a little giddy inside when hear he is coming out with something new. When I played this game I was not disappointed. It is a lighter game with plenty of choices, some tension and not too much conflict. Being an agreeable person I also agree that it is an accessible game, though maybe not so much as Ticket to Ride for example. Optimization is a key in this game and can spell the difference between an 80 point victory and a 90 point defeat. This title has many great things going for it in by book. Oh, in case you were wondering, pleased is a light orange. This entry was posted in Reviews and tagged Asara, Michael Kiesling, Ravensburger, Wolfgang Kramer. Bookmark the permalink. I’ve played this several times now and still like it. I was thinking that the best strategy was to have as many towers as possible, without really caring of the height of them.. But at Christmas I was defected by a friend who had just 3 towers! So there are several path to win! The perfect SdJ in my opinion. Don’t think I’ve ever heard the word “bling” used when describing castle building, but I like it. I also like the game. Like you said it’s not a brain burner but it’s one of those games that is impressive looking but easy enough to teach to non-gamers. Another good game that falls into this category is Valdora. @Emanuele: I think you’re right that the sign of a good game is when you THINK you have figured out an unbeatable strategy, then have that belief proven false by someone else. In the games we have played I have seen the ‘bling’ as I refer to it gobbled up by one individual who created only the tallest towers, while other games have been won by the multiple tower builder. You’re also right that I would be surprised if this was NOT on the SdJ list. @Greg: Valdora is an interesting comparison as in both games you have quick turns and many possible choices to make. Somehow, this game slipped under my radar. I played it two weeks ago for the first time and loved it. I immediately went out and bought my own copy. It hits a sweet spot for me, there are enough decisions to make the game interesting and, as Greg pointed out, it plays in 60 to 90 minutes. After just my second time playing it I also saw SdJ written all over it. As far as the lighted windows go, I’ve been in more than one game where they became important as tie breakers. I will always include them.